black ceramic bodies are brewed to perfection. They're available for '95 - '12 FLH / FLT models. These non disc-based, massive 4" Slip-Ons allow riders to make a bold statement with their newly developed core. The streamlined, internal tapered, black ceramic-coated, contrast cut end cap with recessed fasteners comes pre-installed. Optional replacement end caps are available for an even more stylized look. 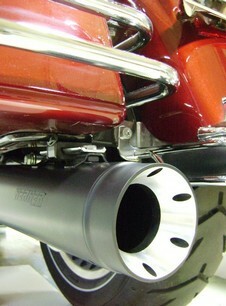 The newly shaped inlets flow better into the OEM head pipe as well as SuperTrapp True Dual Head Pipes. The SuperTrapp Stouts tapered core is minimally louder than stock for '10 - '12 FLH models. SuperTrapp Stout Slip-Ons provide a bolt-on heavy, broad spread power curve right from idle w/ a 9.3 (16%) hp and 10.5 (14%) torque gain over stock (measured on a stock 2010 FLH). At 95.6 dB @ 2,000 rpm, or 2.4dB over stock, SuperTrapp Stouts are SAE-J2825 sound compliant. Kerker Stouts utilize a more traditional core which targets a higher spread of power providing more mid range RPM up through redline. Hand-crafted for your riding pleasure, they provide a bolt-on, strong power curve from mid range on up with a 9.6 (17%) hp and 9 (12%) torque gain over stock (measured on 2010 FLH). Louder than the SuperTrapp version, Kerker Stouts are 97dB (per SAE-J2825) or 5dB over stock with that classic Kerker, deep, heavy rumble. The predominantly displayed Kerker logo lets everyone know that your pipes perform! Kerker Stouts are bold and powerful. SuperTrapp and Kerker Stout 4" Slip-Ons are also available in chrome. Request 2012 catalogs by filling out our "Catalog Request Form". Like SuperTrapp and JayBrake on Facebook. Follow SuperTrapp on Twitter. For more information on all SuperTrapp, JayBrake and FPS Racing products visit SuperTrapp.com, or call 216-265-8400. SuperTrapp, Kerker, Road Legends, JayBrake and FPS Racing are all part of the SuperTrapp Industries, Inc. family of manufactured brands.